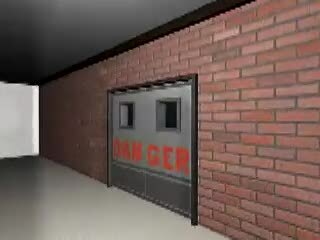 In November of 2000, I was asked to animate a walkthrough for a building model that our instructor, David Sparks, supplied. We were to light the model, and animate the camera with realistic motion for someone walking through the building (minus the left-right bobbing motion one sees in a FPS game like Doom). I added the red danger sign to the metal door at the end, but otherwise made no changes. I used the model again for my lighting project about a year later, although I made significant changes to the model at that point.